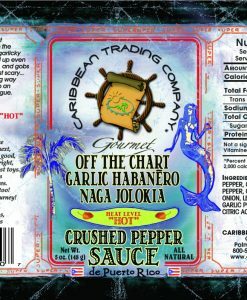 Our Off the Chart Garlic Habañero Naga Jolokia Crushed Pepper Sauce is a hot one. Naga Jolokia Ghost and Habanero double the peppery pleasure of this garlicky greatness. Things get juiced up even more with carrot, lime, onion, and gobs of garlic. So spicy, it’s almost scary… in that good thrill-seeking way that makes every drop an adventure for your tongue.